We all know that smoking is bad for your health. But, one area of health that’s often overlook is oral health. Smoking and tobacco use in any form produces serious implications on oral health. Tobacco use doesn’t just cause bad breath or staining, but can also lead to gum disease, tooth decay, oral cancers, and more. As a family dentist in Weatherford, you want to see you be as healthy as possible. For those who smoke or those who have quit, we offer the services you need to help repair the damages to your teeth and gums caused from smoking. Smoking is known to cause tough stains on teeth, as well as bad breath. However, smoking also has a larger role in causing poor consequences on your oral health. Smoking is directly linked to causing gum disease because tobacco use is known to decrease the body’s ability to fight infections. As a result, when bacteria begins to accumulate in the mouth, your body is less capable of fighting the bacteria. Once the gums have been damaged, smoking also makes it more difficult for the gums to heal. Not to mention, some gum disease treatments may not be effective for some smokers, leading to additional implications of gum disease. With smokers twice as likely to develop gum disease than a nonsmoker, it’s extremely likely a smoker will develop gum disease, which the risk further increases the longer you smoke. In addition to an increased risk for gum disease, smokers are more likely to experience tooth loss and tooth decay as well. As the bacteria sits on the teeth, it begins to eat away at the enamel, causing tooth decay. When left untreated, the tooth may eventually be lost. Not to mention, gum disease will overtime lead to tooth loss when left untreated. However, as treatments may not be effective for smokers, the risk for tooth loss further increases. In fact, smokers were found to be twice as likely to lose teeth within 5 years of completing periodontal treatment. Overtime, smokers won’t just experience tooth loss, but bone loss as well. In fact, bone loss is five times more likely in current and former smokers than nonsmokers. Once tooth loss has occurred, smokers may have limited options to restore missing teeth. Since smoking decreases the body’s ability to heal and fight infections, many smokers aren’t candidates for dental implants due to the high failure rate of implants healing in smokers. Not to mention, the decreased ability to heal makes bone grafting difficult. Of the greatest concern is the risk for oral cancer. 90 percent of people with an oral cancer have used tobacco. Overall, smokers are six time more likely than nonsmokers to develop oral cancer. All forms of tobacco, whether chew, cigars, or cigarettes, are known to increase oral health complications. 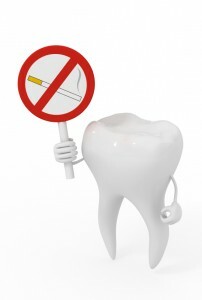 At Cosmetic & Family Dentistry, we’ll help repair the damages caused by smoking. As a leading dentist in Aledo and Weatherford, we have the comprehensive treatment plans you need to repair the damage of tobacco. by: Dr. Deborah Romack at March 10, 2016 .